EEMB is a popular company founded in 1995 which specializes in the production of primary lithium batteries and rechargeable lithium batteries such as Li-SoCL2, Li-MnO2, Li-SO2, Li-Ion, Ni-CD, Ni-MH, Li-Polymer and Alkali. After years of constant efforts, today the company's products are exported worldwide and as the company has strong international sales network. 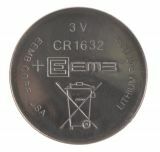 The brand EEMB gained an excellent reputation for quality batteries in the industry and has won many ineternational clients. EEMB implements the latest technologies and improves constantly the manufacturing systems that comply with ISO9001: 2000 - Quality Management System. The production facilities of EEMB occupy an area of more than 20,000sq.m and the company employs over 700 skilled workers. VIKIWAT Ltd. is a wholesaler and retailer and offers a variety of EEMB batteries. In our offline and online stores you can find lithium batteries, rechargeable lithium batteries, LI-MH battery holders and many other batteries with low prices with fast delivery. Lithium-ion battery EP10450, 3.6V, with conductors Li-ion battery ER10450 with nominal voltage 3.6V and capacity 700mAh. Battery CR1632, VARTA Coin cell battery CR1632, with voltage 3 V and capacity 120 mAh.